Are you using family sharing? 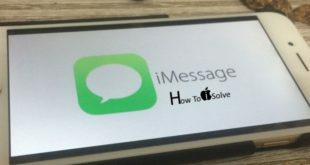 Then know useful tips on how to turn on/ Enable ask to buy feature in the family sharing on iOS devices and Mac OS X Yosemite. Throughout this tip, you can give your kids to freedom to make their own choice while still controlling your spending. We can say that this is an awesome feature of Apple iOS 8. Because using this, family organizer of family sharing group can setup request and make purchases with Ask to Buy. What happen if Ask to buy feature is Turn On? The only family organizer can turn on/ enable Ask to buy feature for any members who isn’t an adult. In short, it’s a kind request to buy items in the iTunes, iBook, App Store, iCloud Storage, in- App Purchases, or newsstand subscription. A family organizer can be pass permission for automatically download or also decline the request of family member likely free download or purchase app; from their own iPhone, iPad, iPod Touch or Mac OS X Yosemite (10.10). If they decline the request, then no download or purchase will take place in family member device. Follow beneath listed steps for those family members who are under 18* in your family group. Open Settings app > Profile Name > Family Sharing > Tap on Your Family Member name and Enable Parent/Guardian option. 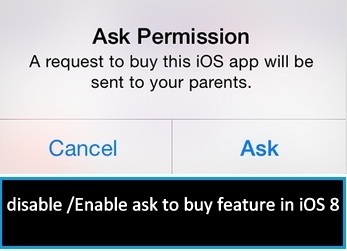 Once you enabled, Parent/Guardian can allow permission or change settings “Ask to buy” for Child added in family sharing. Your Family member will Receive notification. Step 3. Now, tap Family and Tap your Family member’s name. Step 4. Tap Ask to Buy and do Turn On. That’s it. Hope, you’ll successfully get which you want. Ask to buy is turn on default for any children under 13 year old. 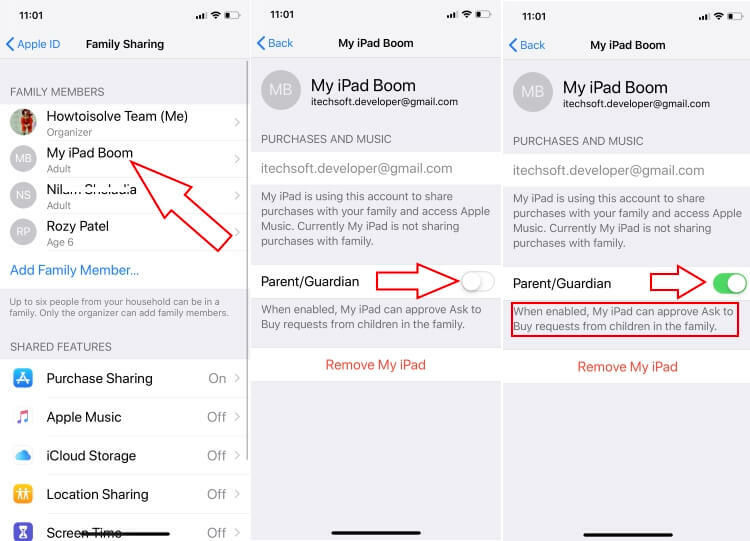 For iOS 11: Disable Parent/Guardian under family sharing on iOS, Settings > Profile name > Family sharing > Tap on Added account > Disable Parent/Guardian. If you’re a family organizer, then you’re eligible to disable or turn off ask to buy feature in the family sharing on iOS 8. Step 4. Tap Ask to Buy and do turn off toggle. Please feel free to ask us, if any misunderstanding relates to this post how to enable ask to buy feature in the family sharing on iOS 8. We’re ready to give replay.